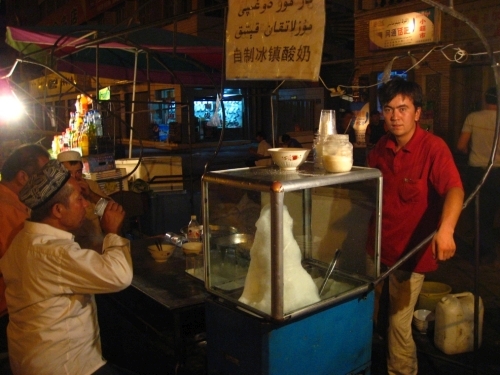 I first tasted durap at the night market in Turpan. Sweet, cool, tangy, and refreshing, it was like no other yogurt I’d had before. It’s thin yogurt served over shaved ice and sweetened with sugar or honey. Some people also call this “doogh”, though in other countries that word refers to a saltier yogurt drink. The stand where I first tried durap. Many years later, having discovered kefir, I realized how similar it was to durap. You can make something that tastes very similar at home. 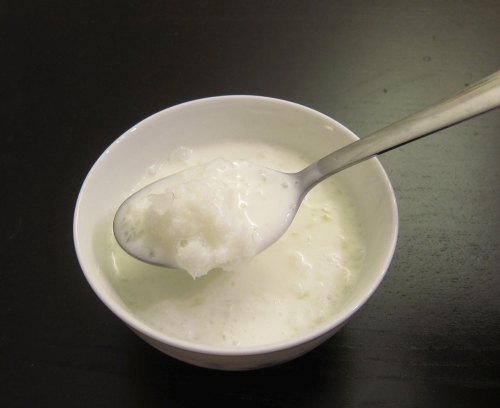 Just mix some plain kefir together with sugar or honey, then pour over shaved ice in a bowl. In the US, Trader Joe’s stocks a great plain kefir, and Lifeway brand is fairly easy to find in groceries.